Imachibundu Oluwadara "Chibundu" Onuzo (born 1991) is a Nigerian novelist, Her first novel, The Spider King's Daughter, won a Betty Trask Award, was shortlisted for the Dylan Thomas Prize and the Commonwealth Book Prize, and was longlisted for the Desmond Elliott Prize and the Etisalat Prize for Literature. Chibundu Onuzo was born in Nigeria in 1991, the youngest of four children, of parents who are doctors, and grew up there in Lagos. Chibundu Onuzo's book Welcome to Lagos is currently available from LibraryThing Early Reviewers. 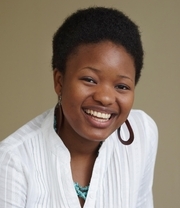 Chibundu Onuzo is currently considered a "single author." If one or more works are by a distinct, homonymous authors, go ahead and split the author. Chibundu Onuzo is composed of 1 name.